…as stated by the Editor of The Australasian Band and Orchestra News in 1929. The Editor was undoubtedly writing from his point in time. However, the story of Victorian State school bands starts well-before this time and continued on to form a much greater legacy. To understand this story will put the Editor’s words into context. The formation of school brass bands was as much about education as it was about banding and music. Like their community band counterparts, some Victorian school bands developed remarkable reputations, and were involved in occasional controversy. We can see this not only through the newspaper articles of the day, but also writings in books from eminent educationalists. Perhaps we can also view their formation as ‘being in the right place and the right time’ as there was a bit of good-luck that led to their wide spread creation. Who knows what might have happened if all the pieces of the puzzle had not fallen in place together? This post will present a brief history of the Victorian State school brass bands as a whole, rather than telling the history of each individual band. The history will show how some of the greatest brass band personalities of the day were involved in training the young and what banding did for some schools. It can also be shown how the reputation of Victorian school bands spread beyond the State and there are even some interesting stories of school brass bands in other states. It is important we recognize contribution of school brass bands within the fabric of brass banding in this country. History can be fickle and to try to pin down a definitive start date of school brass bands is difficult, if not impossible. It must be recognized that communication was somewhat difficult in the early 20thCentury across Victoria and news of the efforts of one town might not get heard of in another town. This being said, the schools were not the first institutions to start younger brass bands. Two Orphanages, St Augustine’s in Geelong and St Vincent de Paul in South Melbourne both started brass bands. These brass bands were started in the middle to late 1800’s and developed fine reputations as well as achieving ongoing competition success – the St Augustine’s Band was already asking for support for a new set of instruments in 1898 (“ST. AUGUSTINE’S ORPHANAGE BAND.,” 1898). In 1918 a different kind of boys band was started in Richmond and for its short existence became a local, if not very large institution (“Richmond Boys’ Brass Band,” 1918). The first instances of school brass bands being started come from country areas. 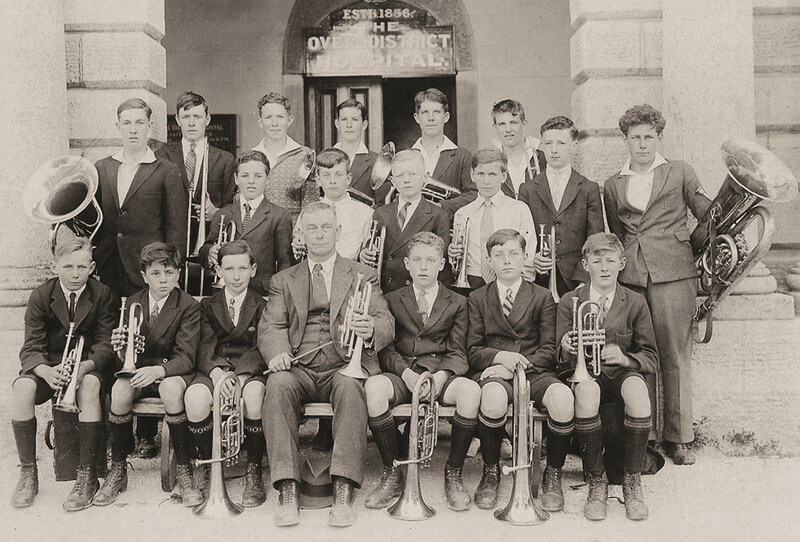 In 1913, a meeting was held in the town of Berringa which is south of Ballarat with the aim of forming a school brass band, which they did using the instruments from the defunct Berringa Brass Band (“BERRINGA.,” 1914; “BERRINGA,” 1913). A year later another school brass band was started in Bairnsdale in East Gippsland where they made the claim of being the first in Australia (“State School Band.,” 1914). These weren’t exactly auspicious starts to school brass bands in Victoria (or Australia) and it wasn’t until the mid-1920’s when a true school brass band movement was started. The encouragement of instrumental music in schools, leading, it was hoped, to the increase of village bands and family orchestras. The encouragement of the art of reading aloud – with special emphasis on reading aloud in the family circle. The encouragement of nature study, again with the object of making home life, especially in the country, more attractive. The Gillies Bequest, as a perpetual fund, was gratefully received by the Education Department and a plan to implement the will was undertaken with teaching representatives (“MUSIC AND READING.,” 1925). In terms of providing money for instrumental music, the interest arising from the Gillies Bequest was invaluable at the time (and in subsequent years). It is from this time that the formation of school brass bands (drum & fife bands and school “orchestras”) gathers pace. 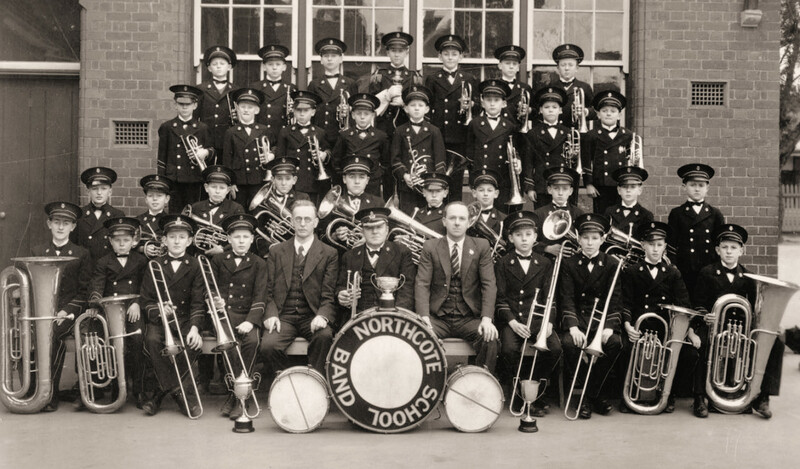 A picture of the newly formed Northcote Central State School band appeared in The Argus newspaper in August, 1926 – and here we see one of these historical discrepancies as it probably wasn’t the first school band (“FIRST STATE SCHOOL BAND AT PRACTICE.,” 1926). In 1928 there’s even more activity with the formation of the very famous Hyde Street school band, the West Preston School Band and discussions are held regarding the formation of a band for the Prahran Technical School (Hyde Street Youth Band, 2015; “Junior Brass Band for Prahran.,” 1928; “WEST PRESTON SCHOOL BAND.,” 1928). Unfortunately, it is unclear just how many bands are formed during this initial time. Signs have not been wanting that the promulgation of the brass bands movement in the State schools of New South Wales, Victoria, and elsewhere in Australia is rather resented by some of the headmasters and passively regarded by many of the others. Various complaints have come from certain localities in which suggestions for State schools bands, made in zealous good faith by bandmasters willing to do the lion’s share of the work, have been coldly shouldered off by the men who should have been first to welcome them. It was probably not the best idea to insult school headmasters if you want them to build band programs in their schools. The Editor goes on in his editorial to wax lyrical about the problems of headmasters – this takes up much of the first page (“THE EDITOR’S BATON,” 1929). In fact, much of the article is about criticising the educational ideas and conduct of headmasters, but his concerns about schools finding bandmasters is misplaced. For example, the first bandmaster of the Northcote Central School brass band and the Hyde Street band is none other than Frank “Massa” Johnson, the famous band conductor who was in charge of many other famous bands in Melbourne. (Rasmussen, 2005). The first conductor of the West Preston school band is the bandmaster of the local Preston band (“WEST PRESTON SCHOOL BAND.,” 1928). So not only did the school bands form, they were run by the best bandmasters in the business! In the next decades, the number and reputation of the school bands expanded, and the first competitions were undertaken. In 1930, the very first competition was held between State school bands in the Exhibition Buildings which involved bands from “Albert Park, Ascot Vale West, Armadale, Coburg East, Coburg West, Footscray, Northcote, Preston West, Princes Hill and Wonthaggi” (“BAND MUSIC IN SCHOOLS.,” 1930). The contest was attended by the Minister for Education and Director of Education, Mr M. P. Hansen (“BAND MUSIC IN SCHOOLS.,” 1930). In another boost to the status of the school brass bands, the adjudicator at the next South Street Eisteddfod was a very famous bandsman from England, a Dr Cyril Jenkins who was visiting Australia at the time and commented on the quality of the school bands (“JUDGE PRAISES SCHOOL BRASS BAND.,” 1930; see also “NOTED MUSICIAN.,” 1931). In 1932 a book was published by the then Director of Education, Mr M. P. Hansen titled Thoughts that Breathe. In this wide-ranging and progressive book (for its time), Mr Hansen covers all manner of educational theory including advocating for more clubs and associations in schools, of which he devotes a whole chapter to this subject (Hansen, 1932). More importantly, Mr Hansen comes across as a strong and measured advocate for school music programs and he details, as a result of the Gillies Bequest, just how far Victorian ensemble programs have grown. By 1932 in Victorian schools there are, “31 brass bands, 9 orchestras, 13 fife bands and 23 violin classes” (Hansen, 1932, p. 79). This is quite remarkable growth. By 1937 the number of school brass bands has apparently risen to 50 in Victoria and 20 in New South Wales (“BANDS IN VICTORIA,” 1937). The reputation of school bands is also growing during this time and in 1936 the Princes Hill school band goes on a tour to Adelaide (“PRINCES HILL STATE SCHOOL.,” 1936). The touring band is greeted with much interest and the bandmaster of Princes Hill was invited to speak on the benefits of forming school brass bands, which, Adelaide apparently didn’t have at the time (“SCHOOL BANDS IN ADELAIDE,” 1936). Reputations are also growing through competition success. The Hyde Street school band in particular is noted for a runs of multiple competition successes from 1931 – 1966 (“AROUND THE SCHOOLS: THE ARGUS JUNIOR,” 1947; Hyde Street Youth Band, 2015). The school brass bands had their own association running competitions – the Victorian State Schools Band Association and competitions specific sections for school bands were run at the South Street Eisteddfod in Ballarat (Royal South Street Society, 2017). In one instance, a competition was run at the Zoo (“SCHOOL BAND CONTEST,” 1939). School brass band competitions, like those in the senior band world, were not always without controversy and in a noted competition in 1950 a protest was registered by the Hyde Street school band against the band from East Kew alleging that East Kew Victorian Bands’ League registered musicians in their group (“School to lose band award?,” 1950). Obviously, there was this stigma, and perception that school-age musicians who also played in VBL bands were of a higher standard. Unfortunately, in some areas the local band ceased to operate, but this sometimes proved a benefit to local schools who were the beneficiaries of their instruments. Such is the case in Cranbourne where in 1940 where the local band ceased to function and handed all of its instruments to the local school and scout group (“Cranbourne,” 1940). When reading about the school bands in past years, the perception, especially in Victoria, is that the school brass bands were only for boys. Certainly, there was no written rule stopping girls from joining but it must be assumed that educationally, it was not something that girls should do, or could possibly be interested in. This was a situation that didn’t change for many years in Victoria. However, over the border in New South Wales it was very different. We see in an article in 1949 that the Balranald School Band not only had girls participating, but they were regarded as very good musicians too (“GIRLS and a BRASS BAND,” 1949). This might be a rare example, but it shows the different attitudes on display at the time. The issue of gender and instruments is an interesting issue to explore – but might be for another post. Things always change and in world of school brass bands this was no different. We know that some school bands survived or evolved. The Hyde Street school band evolved to become Hyde Street Youth Band and out of all the school bands, this one was the only band to survive as a brass band (Hyde Street Youth Band, 2015). Other school music programs evolved to set up new ensembles such as concert bands which included woodwind instruments. It must be assumed that some bands just ceased to exist, and the only memories are from photographs and old school records. There were so many school bands in the 1930’s and 1940’s – it would be interesting to know what happened to some of them. The story and history of school bands is fascinating and could probably be better explored through the research of additional records. This being said, the newspapers of the day did detail an amount of history and it’s quite fascinating to see what the bands achieved. Certainly, there were a foundation for senior bands in their local areas and local bandmasters were involved. They were a product of their time and their legacy won’t be forgotten. THE EDITOR’S BATON: Bringing up the boy to the band. (1929). The Australasian Band and Orchestra News, XXV(2), 1 & 3. Hansen, M. P. (1932). Thoughts that breathe. Melbourne: Robertson & Mullens. ‹ PreviousAffiliation and location: The Victorian Bands’ Association to the Victorian Bands’ League.